Celebrating Mid-Autumn with Mooncakes and a Mid-Autumn Reunion Set Dinner! As we approach the coming festive of Mid-Autumn, it’s time again to savor mooncakes! These delicacy traditional treats symbolizes the joy of reunion during this festive season with family and friends. 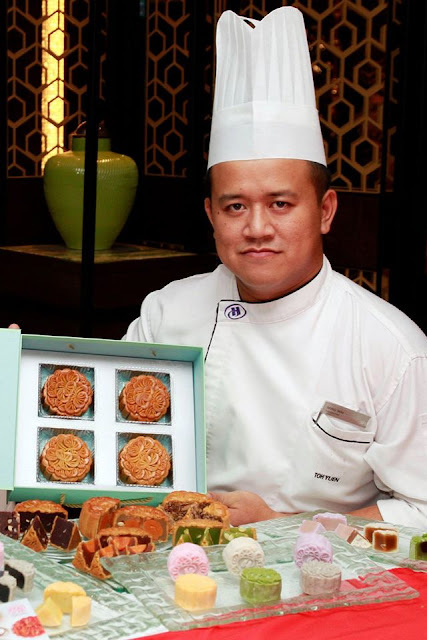 This year, Toh Yuen from Hilton Petaling Jaya is presenting their five premium baked mooncakes and its refreshing twist of pillowy snowskin selections with delightful velvety fillings. Toh Yuen’s mooncakes are beautifully encased in a Celadon hued gift box this year in themed with its restaurant. The gift box makes an ideal and elegant gift to family, friends and business associates. Diners can buy them ala-carte or in gift box sets of 4 baked skin or 6 snow skin mooncakes. The Traditional Baked Series features Red Bean Paste, Pandan Paste, Pure Lotus Paste with Single Yolk, Mixed Five Nuts and White Lotus Paste with Double Yolk. These are priced from RM23 to RM26 each or RM88 in a box of 4. The Snow Skin Series offers mini mooncakes of Lotus Paste with Sunflower Seeds, Yam Paste, Green Tea Paste with Red Bean, Black Sesame Paste and Dragonfruit Paste. These are priced at RM17 each or RM118 in a box of 6. There is also the premium Snow Skin Musang King Durian Paste where the King of Fruit is now a favorite treat of many during this festive season. The premium Musang King Durian Paste mooncake is priced at RM34 each. All Toh Yuen’s mooncakes are made with less sugar for a health purposes. Enjoy 20% early bird discount for 10 boxes and above purchased before 15 August 2015. Also enjoy 15% discount for purchase of 100 boxes and above as well as 10% discount for purchase of 50 boxes and above. CIMB card holders also enjoy 20% discount when they present their card when purchasing these petite treasures. Prices are inclusive of 6% government tax for take-away. For orders, please call (03) 7955 9122 ext. 4073/4. Besides celebrating the festive with mooncakes, diners will also be able to enjoy an exquisite Mid-Autumn Reunion Dinner with your loved ones and business associates at the Toh Yuen Chinese Restaurant. Enjoy Cantonese cuisine set in an elegant contemporary ambiance this September month with Toh Yuen specially crafted 8-course Mid-Autumn Reunion Dinner Feast by Executive Chinese Chef Ben. An unusual appetizer to kick start the dinner but the Boiled Beef Ribs with Lemongrass scented Spicy Garlic Sauce is simply delicious. Tender and lean, the beef pieces are superb when dressed with the moreish spicy sauce redolent of lots of lemongrass and garlic. The next course of Double Boiled Cucumber with Scallop Soup Topped with Green Peas was a pretty sight of whole dried scallop stuffed into cucumber braised till soft and topped with snow pea. Sitting in a pool of golden supreme broth, the dish was full of seafood essence and soothing in comforting flavours. Chicken with Salted Egg with Barbeque Sauce was a personal favorite simply because the flavours rocked! Pieces of fork tender chicken thigh topped with salted egg yolk and pan seared before being covered in a Chinese sweet and tangy barbeque sauce. The next course is fish and we are sure that the Baked Cod Fish with Wasabi Mayonnaise will be a crowd pleaser. The highly prized cod is well marinated and baked to a golden hue. It is lightly smoky, sweet and savory with light hint of wasabi. The cod is paired with some greens to balance up the richness of the fish. Pan- Fried Lamb Chops with Coffee Sauce evoked the East meets West influences where rack of lamb is marinated in Chinese seasoning and glazed with a coffee sauce. Served on a bed of sautéed onions and peppers, the lamb is tasty and robust with coffee flavour masking the heavy aroma of the lamb. The bit so fat on the lamb also added more flavours to the tender meat. The Stir –fried Scallops with Dragonfruit and Lotus Root was a delight to eat. A platter of colors of crunchy lotus root, peppers and dragonfruit compliments the sweet fresh scallops so well in flavours and textures. This dish is really easy to enjoy with all the ingredients’ natural flavours. The feast ended with another East meets West dish of Deep fried Chinese Pancake with Ice Cream. The Mid Autumn Reunion Feast is available at RM1800 nett for a table of 10 persons from 1 September – 27 September 2015. The menu items are also available on ala-carte from RM30 nett per dish. Price is inclusive of 10% service charge and 6% government tax. For reservations, please call (03) 7955 9122 ext. 4073/4. Visit Hilton PJ’s F&B blog, www.ZestPJ.com for latest F&B promotions and entertainment scenes.